We’d love your help. 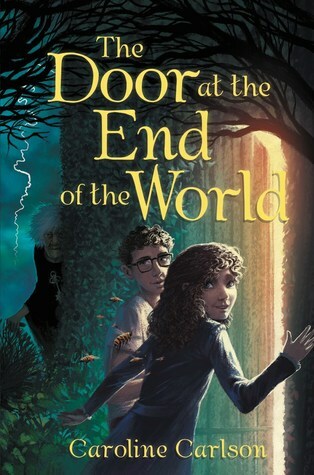 Let us know what’s wrong with this preview of The Door at the End of the World by Caroline Carlson. Step into the worlds outside our own as Lucy Eberslee must find a way to stop a dangerous force that threatens the fate of the eight worlds in Caroline Carlson’s latest middle grade novel. What begins as a rather unremarkable Tuesday quickly turns to disaster when Lucy, the Gatekeeper’s deputy, discovers that her boss has vanished and the door connecting Lucy’s world to the Step into the worlds outside our own as Lucy Eberslee must find a way to stop a dangerous force that threatens the fate of the eight worlds in Caroline Carlson’s latest middle grade novel. What begins as a rather unremarkable Tuesday quickly turns to disaster when Lucy, the Gatekeeper’s deputy, discovers that her boss has vanished and the door connecting Lucy’s world to the next world over is broken—and it all might be Lucy’s fault. To save the Gatekeeper and set things right, Lucy must break the rules for the first time ever and journey with an otherworldly boy, a suspiciously sneaky girl, and a crew of magical bees into the seven worlds beyond her own. To ask other readers questions about The Door at the End of the World, please sign up. Caroline Carlson pulled off the perfect trifecta of middle grade adventure, humor and surprise in this sci-fi/fantasy novel. Part Diana Wynne Jones, part Pratchett - this book will easily be a new favorite. Lucy is the perfect heroine with both pluck and self doubt. Readers get to look at their own world a bit sideways, proving to them a new perspective is around every corner. I wish there'd been more; the story galloped along briskly in that really nice middle grade fantasy adventure way of magical happenings and bright changes of scene and mood (with, you know, a herd of magically intelligent cows arriving on the scene, as they do) and then there was the peaceful gathering of loose ends (which is one of the parts I like best in mg fantasy), and then...the last page and it was over. Sigh. I thoroughly enjoyed this book. I think my grade fives will love it too! Adventure, humour (loved the bees! ) friendship, mystery and gates to other worlds! What more could you want! Lucy, Rosemary, and Arthur team up to help save the worlds- all eight of them! This part-fantasy, part-sci-fi MG novel is a thrill-ride adventure! Caroline Carlson is the author of funny and fantastical books for young readers, including The Very Nearly Honorable League of Pirates trilogy, The World’s Greatest Detective, and The Door at the End of the World. Her novels have won accolades from the New York Times, the American Booksellers Association, Bank Street College of Education, the American Library Association, and Junior Library Guild, Caroline Carlson is the author of funny and fantastical books for young readers, including The Very Nearly Honorable League of Pirates trilogy, The World’s Greatest Detective, and The Door at the End of the World. Her novels have won accolades from the New York Times, the American Booksellers Association, Bank Street College of Education, the American Library Association, and Junior Library Guild, among others.